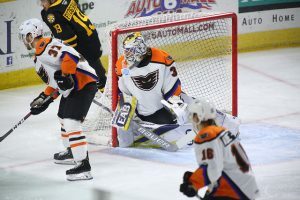 Providence, R.I. – Goaltender Felix Sandstrom showcased his cat-like reflexes in a 40-save debut performance on Friday night as the Lehigh Valley Phantoms won their fourth game in a row via a 4-3 decision at the Providence Bruins. The result keeps the Phantoms mathematically alive in the Atlantic Division playoff pursuit entering the regular-season finale on Saturday at home. And it prevented the Bruins from clinching the last spot on their home ice. 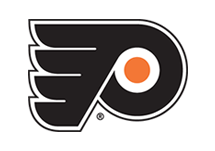 The 22-year-old Sandstrom was a third-round selection of the Philadelphia Flyers in 2015 and joined the Phantoms earlier this week following the conclusion of his team’s season in Sweden. The highly touted netminder was tremendous in turning aside one Providence effort after another in a memorable first-ever game as a pro in North America. 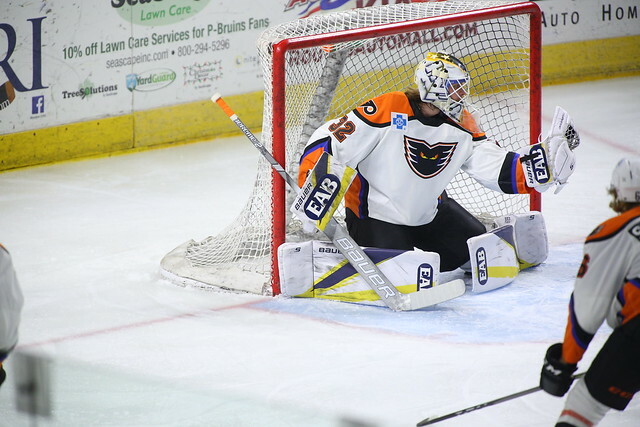 Sandstrom is expected to stay with the Phantoms for next season as well. 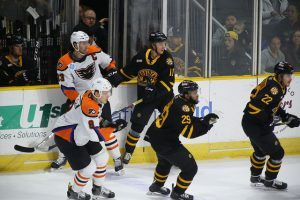 On multiple occasions, Sandstrom was forced to pull the splits or go spread-eagle across the crease for acrobatic saves on some dangerous Providence scoring efforts but the newcomer did not appear to show any nerves with his new team. The Phantoms built a 4-0 lead before Providence rallied late to close the margin to one. Lehigh Valley (38-30-7) took advantage of its opportunities to provide Sandstrom with a little breathing room early in the contest. 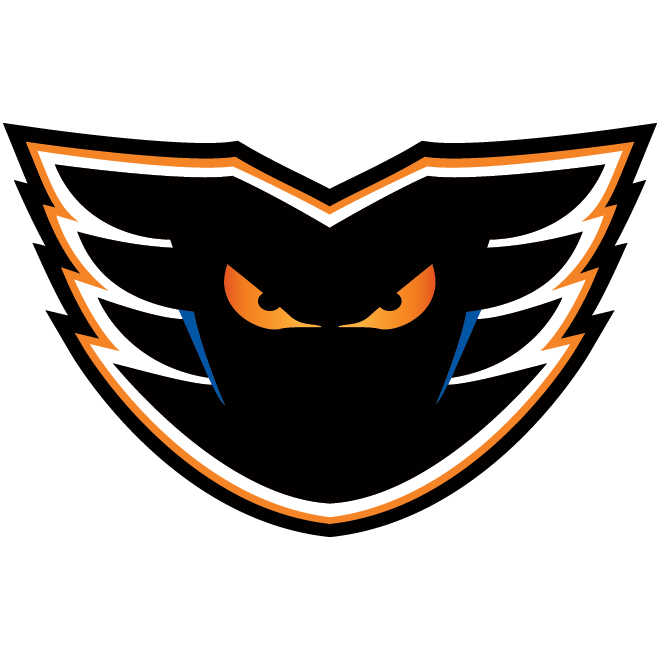 Colin McDonald (12th) extended his goal streak to three games and Byron Froese blasted through his seventh with the Phantoms and 21st overall this season as Lehigh Valley took a 2-0 lead against Zane McIntyre in the opening frame. The Phantoms kept it up in the second period on a power-play goal by Greg Carey (29th) and a shorthanded breakaway marker by Corban Knight (4th). Chris Conner’s assist on the Carey goal was good for his 199th all-time point with the Phantoms leaving him one shy of becoming the first-ever in Lehigh Valley history to achieve the 200-point milestone. Carey’s 61st point places him with all alone with the second-most points in a season in Lehigh Valley history trailing only Phil Varone who recorded 70 points last year in his M.V.P. campaign. Providence (37-26-11) kick-started its rally late in the second period on a power-play goal by Paul Carey (27th) and then another power-play marker by Gemel Smith (16th) with just 0.9 seconds left in the period. Jordan Szwarz (23rd) intercepted and struck for a shorthanded blast from above the left dot midway through the third period to pull the Bruins within a goal at 4-3 but the Phantoms hung on from there thanks to a couple big penalty kills and timely stops from Sandstrom. 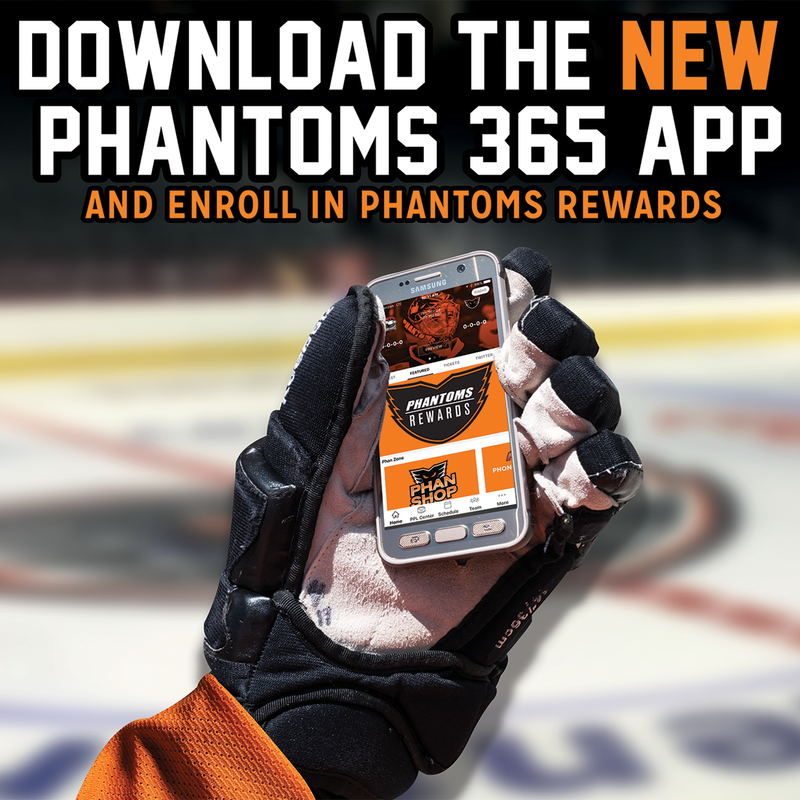 The Lehigh Valley Phantoms conclude the regular season on Saturday against the Hartford Wolf Pack on Fan Appreciation Night with over 1,000 prizes to be given away in a grand celebration of the team’s fifth season in Center City Allentown. 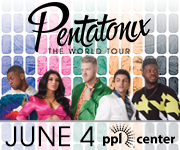 Fans are invited to attend the team’s “Paint the Ice” event at PPL Center on Tuesday, April 16 from 11 a.m. to 1 p.m. and again from 4 p.m. to 7 p.m. 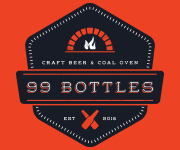 The special occasion is free and open to the public. 1st Period-1, Lehigh Valley, McDonald 12 (Strome, Bardreau), 5:18. 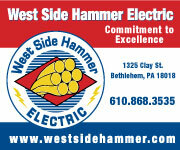 2, Lehigh Valley, Froese 21 (Friedman, de Haas), 7:51. Penalties-Strome Lv (holding), 12:25; de Haas Lv (tripping), 14:51; Cumiskey Pro (double minor – high-sticking), 19:19. 2nd Period-3, Lehigh Valley, Carey 29 (Knight, Conner), 1:04 (PP). 4, Lehigh Valley, Knight 4 (Bardreau), 18:14 (SH). 5, Providence, Carey 27 (Smith), 18:45 (PP). 6, Providence, Smith 16 (Szwarz, Stempniak), 19:59 (PP). Penalties-de Haas Lv (high-sticking), 17:08; de Haas Lv (interference), 19:22. 3rd Period-7, Providence, Szwarz 23 (Blidh, Zboril), 9:35 (SH). Penalties-Goulbourne Lv (slashing), 4:03; Blidh Pro (cross-checking), 4:03; Pond Pro (elbowing), 8:24; Knight Lv (boarding), 11:48; Carey Lv (holding), 15:28. 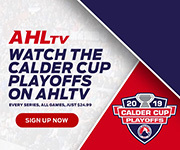 Shots on Goal-Lehigh Valley 5-15-9-29. Providence 13-16-14-43. 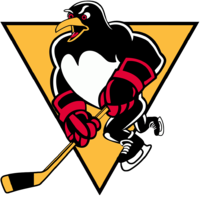 Power Play Opportunities-Lehigh Valley 1 / 3; Providence 2 / 6. 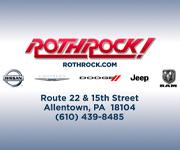 Goalies-Lehigh Valley, Sandstrom 1-0-0 (43 shots-40 saves). Providence, McIntyre 25-13-7 (29 shots-25 saves). Referees-Mackenzie Nichol (68), Michael Duco (82). Linesmen-Kenneth Gates (91), Jack Millea (23). 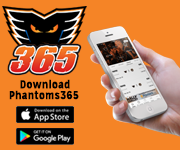 NEXT TIME OUT: The Phantoms conclude the regular season on Saturday against the Hartford Wolf Pack on Fan Appreciation Night at PPL Center featuring over 1,000 prizes for the fans.